There is something about the 'best car in the world' that will make you fall in love with it, even with all the competition around. The Mercedes-Benz S-Class has been a benchmark of accomplishment and excellence since time immemorial. The three-pointed star on the bonnet, the sweeping elegance and the princely stature of the car that has so often been proclaimed as the ‘best car in the world’ is a sight to wake up to. 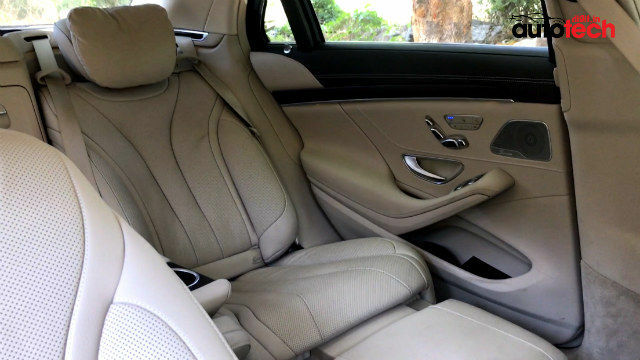 Sure, the best seat is at the back, but take the wheels, and the S-Class cocoons you in a sense of opulence, confidence and magic unlike no other. We, however, had a task at hand - be objective and ‘review’ the Mercedes-Benz S350d. It is the base trim of the S-Class, but in no way do you feel like there’s something missing from here. And base trim it may be, but that doesn’t stop it from being adored and admired wherever it goes. So, when we eventually got over admiring it from all angles, we got down to the task at hand with the objective of the day. Back in the mid ‘90s, I remember seeing an S-Class in downtown Kolkata. The Indian luxury car market was not even present back then, and anyone flaunting a luxury badge back then gained through-the-roof respect wherever they went. It was the third generation W140, and my fancy was immediately caught by the swept-back elegance of the car. We owned an HM Ambassador back then (it is now a family relic), and you can imagine my amazement at spotting the three-pointed star despite not knowing practically anything about it. I had simply never seen anything of the sort, and neither had anyone around me. Fast-forward two decades, and the W222 Mercedes-Benz S350d looks simply sublime. The evolution in the design language is clear, but has an upward curve that befits the S-Class’ stature. The first thing you’ll notice is how long this car is, with total length of 5.25 metres that translates to its 3,165mm wheelbase for practically acres of space inside. The imposing nose and the chrome-laden grille fits that of a limousine, and there is an inherent sense of serenity and power emanating from the car. The side profile is smooth, long and swooping, with an immaculately finished chassis ending in a rear profile that is swept back and curved with a gentle gradient. Chrome outlining around the glasshouse, wheelbase and door handles highlights the car’s accents, and the 18-inch five-twin-spoke high sheen alloy wheels have the staid resplendence that the rest of the car characteristically flaunts. On the inside, the Mercedes-Benz S350d feels like a celebration of all your accomplishments. 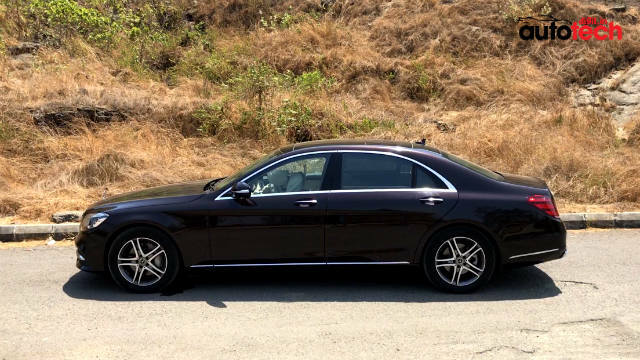 The car we drove had the metallic ruby black finish on the exterior, with silk beige/espresso brown genuine leather upholstery interspersed with Mercedes-Benz’s exclusive designo brown open-pore ash wood. Every single bit inside the S-Class oozes quality - from the solid metal elements like the seat adjusters, ash tray, centre console switchgear that have a beautifully fluted touch, to the plush warmth of the quilted leather, generous doses of comfortable padding, incredibly sublime noise and vibration insulation, all of which are wonderfully contrasted by the open-pore veneer. The Mercedes-Benz S350d is built to last, and everything from the soft-closing doors, the heft of the rear armrest and just the sheer solid quality of every single element inside takes luxury to an all-new level. Up front, you get a single sheath of glass finished without a single aberration, which encloses two 12.3-inch displays. 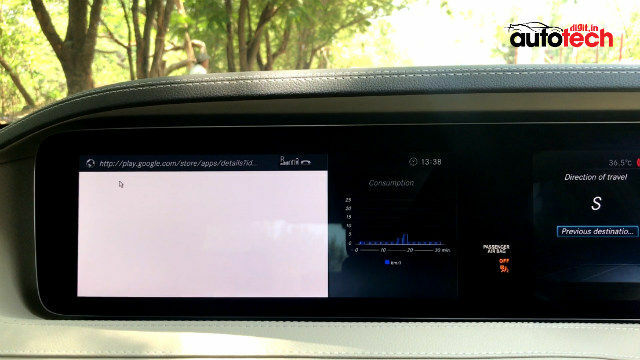 The one behind the steering wheel acts as the digital instrument cluster with a range of complications, and the one placed more central to the car is the primary infotainment system. Every single bit of information on these displays, and even the two 10.2-inch rear entertainment displays are crisp and sharp in terms of fidelity, no less than what you’d expect. The animations are fluid, and like the rest of the car, a bit staid in nature. There’s nothing about this car that has been thought of and put in place in a rush, and every second you’re reminded that neither are you in a rush. If anything, the world shall wait for you to arrive. Every bit of leather inside the car is double-stitched, and there is an analogue clock (like that on the Bentley Bentayga) right beneath the central display, placed between the round, solid chrome air vents. The push knobs provide hydraulic feedback and are surprisingly responsive for such small knobs that do not even require pinpoint accuracy, but when you’re in an S-Class, you would expect such small things to be on point, wouldn’t you? Below these is a row of chrome toggles, which again provide a solid click feedback for the primary air conditioning controls. Below this is a slide-out ashtray and a traditional cigarette lighter, followed further by a bunch of storage areas. Even the cup holders have adjustable side bolsters, so that no matter what the size of your cup is, things do not spill or even rattle. Sitting squarely in the middle of the central column is the control valley, with a host of buttons to control, well, pretty much everything. 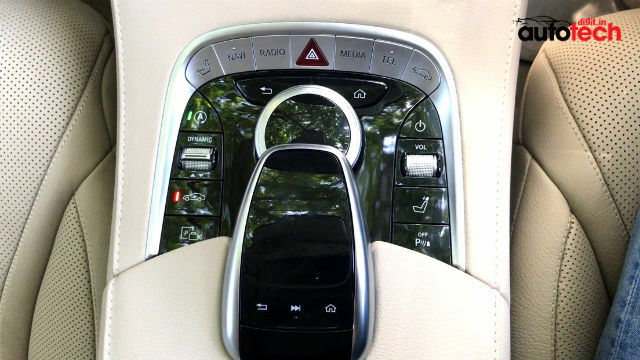 From left to right in clockwise order, the controls include buttons for the 360-degree camera, air suspension height adjustment, drive mode selector toggle, automatic start/stop enabler, seat preference shortcut, navigation, radio, emergency blinkers, media connectivity, telephone, car dynamics, infotainment power, volume toggle, front seat headrest height adjuster and a single switch to turn off proximity alerts. At the centre of all this is a circular toggle that also acts as a multi-way selector, flanked with return and home buttons. If all this is not enough for you, you further get a touchpad with buttons for returning one step or straight to the home screen of the system, or play/pause audio. The touchpad is placed right above the circular toggle, and this particular arrangement is not completely ergonomic. Nonetheless, it doesn’t pose any particular struggle to operate the system. The touchpad is smooth, but has a slightly delayed response, which is a bit of a surprise considering how on-point everything else actually is. The central armrest to the front actually opens both ways, which makes for a very clever bit of engineering by Mercedes-Benz! This includes a wireless Qi charging pad, an SD card slot, two USB ports (one for fast charging) and NFC connectivity. To the door panels, the controls include all the seat controls (the rear seats get both heating and cooling), the fantastic Burmester speaker setup, ambient lighting along all creases, and controls for the front and rear glass roofs, side and rear sun blinds, and the one diagonally to the driver even gets the magical full-recline layout. This gives you an additional 43.5-degree recline, custom headrest and lumbar adjustment, a fold-out ottoman, a footrest, in-seat ventilation and options for both cold and hot massage in varying intensities. You also get loads of gizmos to play around with (more on this later). You get an incredibly elegant fluted metal ashtray (it feels too posh to even put ash inside! 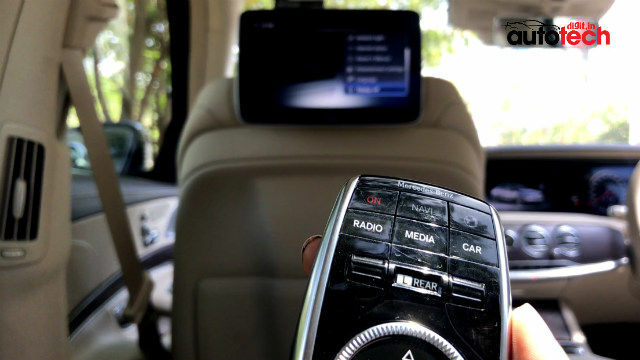 ), your private entertainment screen, custom Mercedes-Benz headphones and your personal remote, which essentially makes the rear seat a very comfortable and luxurious recliner with your personal audio source and video streaming screen, plus a few more comforts. Pity I only have a normal sofa at home. The Mercedes-Benz S350d is a masterclass in the design of luxury. It almost verges on offering more than what you can even get from it in a short duration, and yet, warms up to you almost instantly as you enter it. Everything, from the leather-wrapped steering wheel, its metal-clad controls with two tiny and precise touchpads, the exquisite carpet work, the mesmerising 64-colour ambient LEDs (explained later) and the Burmester audio setup work wonders to make this cabin feel immense. Yet, this is only the basic sketch of what the S-Class can offer, and once you move towards the Mercedes-Maybach S650, you’re talking about unthinkable levels of luxury. 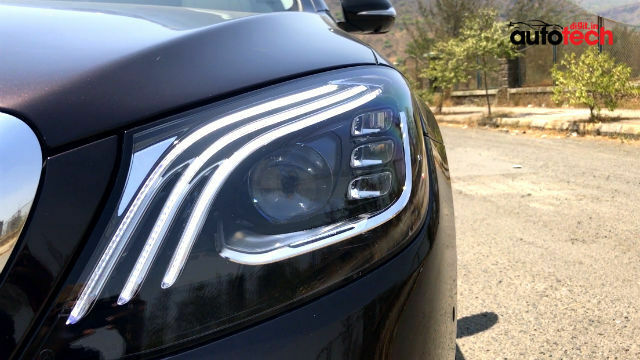 At this point, you probably wouldn’t be too bothered about exactly how adept the Mercedes-Benz S350d is in terms of all the gizmo-freakery. Or, would you? If you’re out looking for perfection and something that offers unlimited opulence, you would at least want everything at your fingertip even if you do not use all of it at one go. Daimler’s chief engineers probably thought the same, went to their drawing boards, and threw in everything that they could, at the point of commissioning the W222. To begin with, the Mercedes-Benz S350d has both front- and rear-facing radar sensors, a host of infrared and proximity surround sensors, and multiple cameras around the car to facilitate semi-autonomous driving. These include advanced electronic stability programme, 360-degree always-accessible camera with autonomous parking, active brake assist with manually adjustable proximity distance, interior sensor-based driver attention and distraction assist, active lane-keeping assistance, blind spot monitoring, cross-traffic alert, pedestrian and obstacle assistance, adaptive cruise control, collision mitigation system, auto-adaptive Highbeam Assist Plus headlamps, automatic bending and cornering lights, and adaptive ‘Airmatic’ air suspension. A few ground rules before setting off, though - ensure that you raise the car’s suspension before you set off on our pothole-ridden roads to avoid scraping the bottom end with speed breakers, and switch off active brake assist and the Distronic function. The S-Class’ pedestrian and obstacle recognition system picks up even small-ish objects that rise above the car’s front bumper height, and applies emergency brakes. Furthermore, in breakneck city traffic, Distronic simply keeps applying a futile effort to maintain safe distance, and with both these features turned on, you are most likely to get rear-ended. The Mercedes-Benz S350d’s semi-autonomous technology works the best on highways with clear lane markings, where it can actually drive itself pretty well. 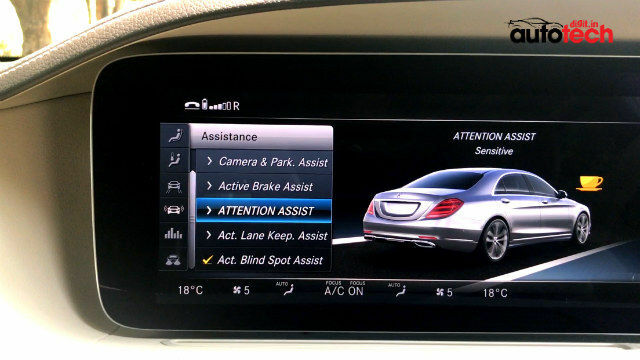 Adaptive cruise control and collision mitigation system always ensures that the car is at a safe distance from any obstacles, with assistive steering maintaining lanes even during curves at speeds of up to 120kmph, and the blind spot monitor keeps an eye out for any approaching car or sudden changes to the car’s front. However, keep your hands and eyes off the road for over one minute, and you get an instant alert for driver attention. There is an option to switch it off, but Mercedes-Benz has added integrated redundancy to ensure no accidents take place because of your autonomous adventures. It is actually incredibly relaxing and exhilarating to have the car drive itself down an open highway, and for all the times that we were reduced to the role of a passenger, we couldn’t help but hope that the front seats too came with massagers (that is reserved for onward of the S400). The 360-degree camera offers excellent, high resolution feed of your surroundings, and is adaptive to indicators and the gear you select (reverse or forward). 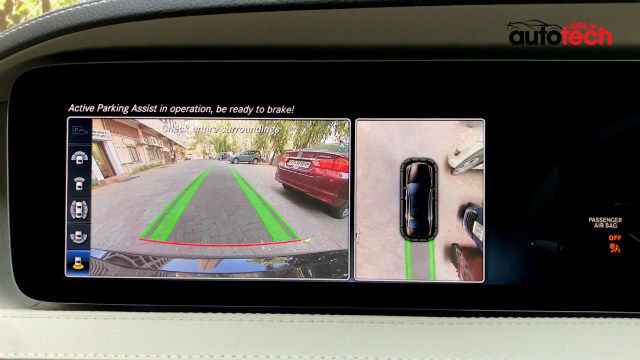 The Mercedes-Benz S350d does not come with a lidar, but has the remaining framework necessary for fully autonomous vehicles. It is still a novel experience to have a car drive itself, and a slightly nervous one at the onset, but the S-Class’ autonomous infrastructure is spot-on, assisting you with every alert that you will ever need on the road. You may find it information overload at the onset (and it is quite an overload, to be honest), but once you get used to it, which you do pretty fast with this one, you will find it exceedingly difficult to adjust to life without all the sophisticated aids. All the semi-autonomous technology also makes the Mercedes-Benz S350d one of the safest cars around. With impact-protection doors, a total of eight airbags and impeccable build quality, the Mercedes-Benz S350d is about as safe as cars can get. Even the windows are double-glazed and reinforced to protect you during crashes. The S-Class scores incredibly high when it comes to its semi-autonomous technology, and adds to it with sublime ergonomics too. The Mercedes-Benz Comand Online infotainment platform is at its full glory here. In default arrangement, it comes with three sections of selectable options - the upper edge for recently accessed options, the lower edge for climate control, seat settings and ancillary functions, and the main central panel. This panel also enters splitscreen mode to show, for example, the navigation screen and the music playback for you to access quickly. The ergonomics of the infotainment setup, though, are a tad complicated, and will take you a while to fully get used to. For instance, quick-switching between the two split displays can be done by pushing the circular toggle to whichever window you prefer, while operating within each of these sections is easier with the swipe panel or the rotary dial of the toggle. The bottom row can also be programmed to access Favourites, while Android Auto and Apple CarPlay fire up instantly without any complications. 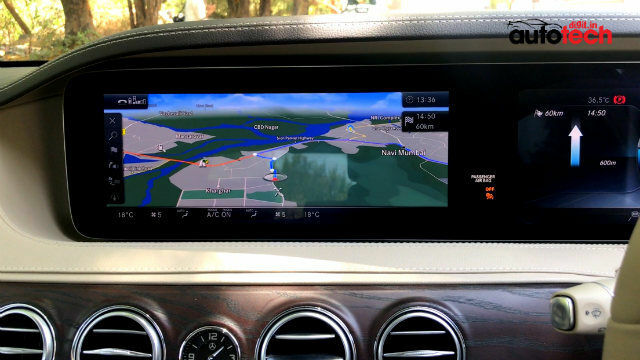 The integrated satellite-linked navigation system can also relay live traffic information and road sign information to the car when tethered to a Wi-Fi hotspot, and the full-colour setup displays total duration and distance of travel time, with multiple route options demarcated in terms of urgency, convenience and comfort. You also get quick access to frequently- and recently-travelled routes, navigation read-out, driving recommendations and points of interest, and even add intermediate pit-stops and get information on how that alters the time of your journey. The same settings can be accessed and read out from the digital instrument cluster, via the touch toggles of the three-part cluster. Once you select navigation on the instrument cluster, you can make quick adjustments from here itself, which looks like a shrunken Comand interface. The interface itself has three themes - Progressive, Sport and Classic. While Sport and Classic retain the same theme barring colour schemes, Progressive mode fuses the tachometer around the digital speedometer at the centre of the digital dial, with gear and fuel readout lined below it. Flanking both its sides are two multi-information panels, which you can use for performance data such as power and G-Force readouts, navigation, music and telephony. It is our favourite mode, and the cool-blue theme went well with our favourite ambient lighting mode, too. The music player gives quick access to auditory refinements you may wish to do to the 13-speaker, 590W Burmester audio system, access all media sources and manage playlists while playing a song already. You get intelligent audio focus for front and rear seats with automatic surround sound optimisation, manual equaliser adjustment, in-music alert settings, speed and traffic-dependent volume limiter, and the ability for the media source to be accessed from the rear. The sound system gets a 9-channel DSP amplifier, which brightens up the entire audio signature with a crisp, warm and rich tone delivery. The noise insulation of the cabin actually intensifies the audio performance, and you distinctly hear the speakers open up to a wider dynamic range once you step beyond the 120kmph speed mark. The connected telematics onboard the Mercedes-Benz S350d also make it ready for the future of connected cars, with an onboard browser, support for apps via MB Comand Connect mirrored through your connected smartphone. The same smartphone needs to be tethered for internet connectivity, which then enables you to browse the web, watch videos via YouTube and access any supported apps via your smartphone. There is support for both Apple CarPlay and Android Auto, although I couldn’t help switch CarPlay often quite often to make the most of the default interface. Connectivity interface for media include Bluetooth, Wi-Fi tethering, SD card slots, USB, NFC and CD/DVD, giving it pretty much everything you would ever need. The connected status can also facilitate live traffic updates and all other satellite-based functionalities, as mentioned above. The four-zone climate control also has a specific ‘air focus’ option, where you can choose exactly what direction would you want air to flow and circulate within your car. You also get an air fragrance mounted to the air vents within the glove box, which we presume can be altered and customised to your preferred perfume, and it also features multiple air filters to keep the air inside pure and clean. Yet another neat touch is the option to adjust footwell temperature separately, which is crucial in the Indian summers. You can set the footwell to be two degrees cooler or warmer than the rest of the cabin, depending on your preference. 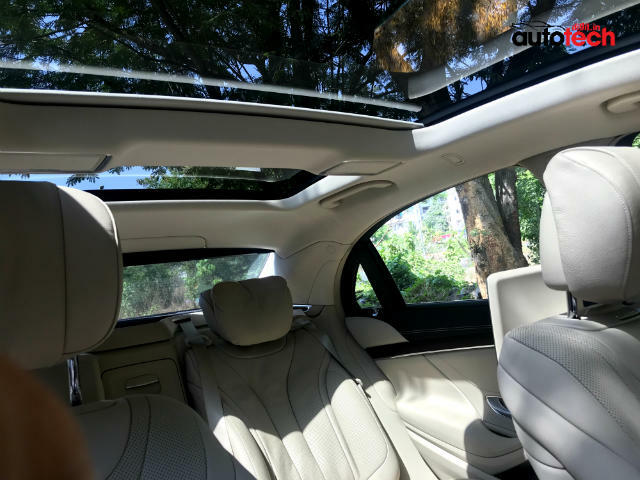 It is yet another nod towards the wellness factor that the S-Class embodies, giving you the impression that the car actually cares about every little element. Alongside the standard preset drive modes, you also get a completely configurable drive mode called Dynamic Select-Individual Configuration. Here, you can configure the engine response and power delivery, air suspension balance, steering wheel feedback and stability and traction control magnitude. The Dynamic Select mode also has engine and vehicle data display, which shows power delivery and torque supply to wheels, and a graphic display of suspension adjustment and wheel turn, which can be absolutely crucial in navigating tight bends or tricky surfaces. The wheel turn indicator is highly precise, which adds to its utility. 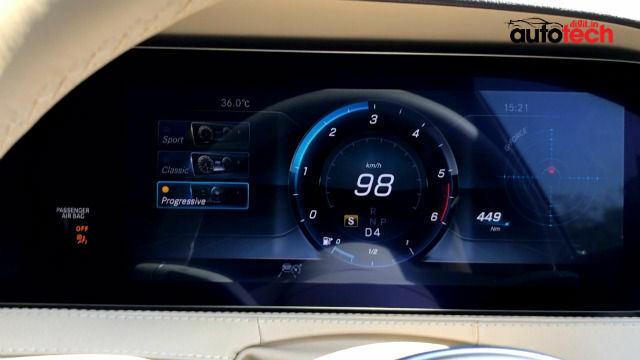 You then get a fuel consumption chart to analyse your, or your chauffeur’s driving pattern. Then, comes one of the biggest draws of the system - the 64 programmable LEDs inside that lead to a festival of colours that almost rival the aurora borealis. You can select these LEDs to work in combination and present multi-colour illumination, animate the lights so they continuously and gradually alter, select specific LEDs to signify seat-wise climate control, and even program separate welcome LEDs and individual brightness zones within the car. All of the LEDs can also be adjusted for brightness in terms of front and rear zones, and Mercedes-Benz has custom-programmed a bunch of combination colour schemes to resplendent effect. 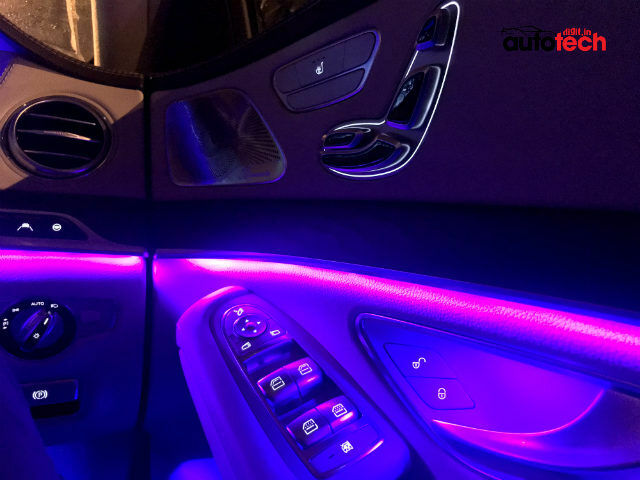 Purple sky, for instance, is a perfect ode to Friday evening blues in our crazy Mumbai timelines, Dawn blue is a beautiful fixture when you’re driving at daybreak, and this makes for, by far, the very best interior illumination that we have ever seen. Sure, it may not get the BMW 7 Series’ glass roof illumination, or even the Magic Sky Control from the S500 and the Maybach lineup, but the 64-colour LEDs can create magic, weave an ambience that can often go beyond words. Other settings via the infotainment firmware include winter tyre speed limiters, reinforced seat belt adjustments and steering/seat retraction for easy ingress/egress. 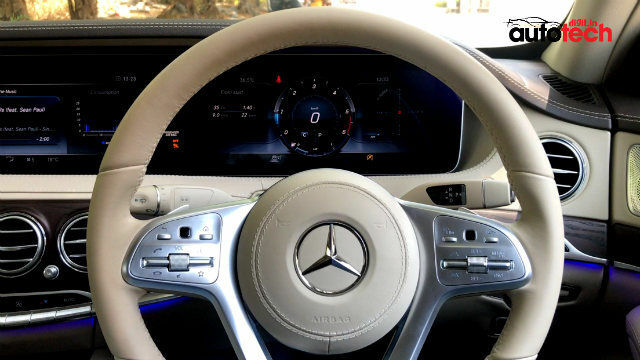 Furthermore, you can adjust the display themes (in tandem with the instrument cluster, as mentioned above), touchpad response, connectivity authenticators, parental control, guest profiling for personalisation, and system backup/firmware update for access to the latest of Mercedes-Benz. At the rear seat, you get a full-reclining seat with three-step heating and cooling, multiple heated and cooled massaging options with varying intensities and contact points, and even your personal headphones and remote control. 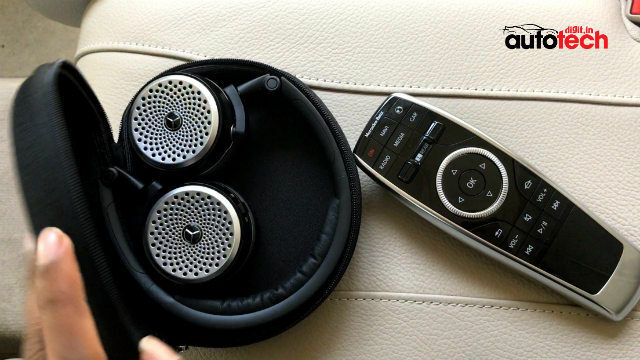 The remotes are still a bit old-school and the headphones are not truly mesmerising, but you do get a bunch of media sources at the rear, and a wireless charging pad. You do not get the concealed refrigerator with champagne flutes as default, and that only comes as an optional accessory. The switch gear for windows also control side and rear sun blinds, as well as the rear moon roof. The rear entertainment screens can also play movies via USBs and DVDs and even streaming via Internet (it really is a home entertainment unit), which is where the headphones come handy for you to watch your own movies. The technology package concludes with the holographic welcome lights on the outside, the unique headlamp glow on startup (the cool blue glow of the three LED indicator/DRL strips look particularly enticing) and, of course, auto-folding lamps. The headlamp glow upon startup and exit are unique every time, and act as locator lamps that do a sort-of handshake with its owner. Incidentally, so do the rear crystal LED lights. The last of this thoroughly exhaustive list is the magical Mercedes-Benz Multibeam LEDs, which are apparently not good enough for the future and will be replaced by Mercedes Digital Light in the long run. As of now, what you get as part of the Multibeam LED package are 84 individually controllable LEDs and four ICUs that use the windscreen-mounted camera to gauge ambience, oncoming traffic and overall amount of light around to throw the ideal light pattern ahead after calculating 100 times every second. On open roads and with no incoming traffic, the Ultra Range Multibeams throw light up to 650 metres ahead when travelling faster than 40kmph. With opposite traffic, in enables anti-dazzle mode to protect oncoming traffic from being blinded by light. If that doesn’t signify class and power, nothing will. It doesn’t matter than the S350d is only the entry to Mercedes-Benz’s S-Class offerings. The S350d features a 2.9-litre straight six that produces 286 brake horsepower and 600Nm torque, all of which you can actually feel when surging down the highway. Despite the weight, length and bulk, the S350d hits 100kph in 6.0 seconds, and can technically go all the way up to 250kmph. The power delivery is linear, and not for once do you feel out of power. There is a constant surge of the engine delivering just about enough to keep you at pace. It is not a particularly exciting engine per se, and just like the rest of the car, the pace of the engine too builds up in a steady manner - with nothing suggesting any hint of being rushed. The 9-speed automatic gearbox is a charm, delivering utter smoothness all through the range. The Airmatic suspension literally wafts you over everything that any road may present to you, and such is its excellence that at times you will be astounded at its high speed stability. The steering wheel offers the perfect feedback, being light to aid handling in city traffic, while offering a heftier appeal down sweeping highways. You see, we’ve just spent over 3,000 words describing and analysing everything that the S350d comes with. And yet, when it comes to the drive, there isn’t really much to exclaim about. Mercedes’ S-Class entry-point is as elegant as cars can get, and even with the least powerful engine of the S-Class family, not for once does it feel lacking. 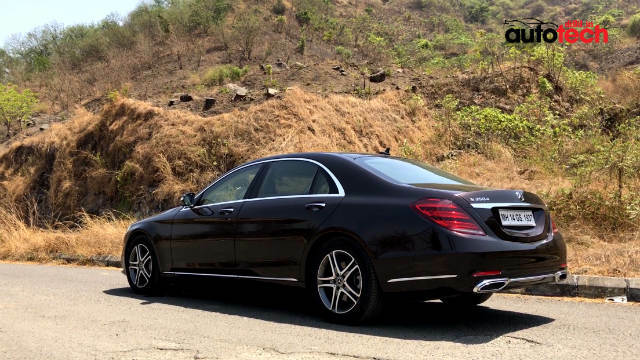 Despite its length, the S-Class is particularly smooth to handle even on tighter roads, and you’ll feel this more once you get used to using all the intelligent aids. The Mercedes-Benz S350d is meant to be a cohesive experience, one where you cannot analyse one aspect by leaving out the other. Its technology package is as much about outright luxury, which is equally about its drivetrain, which further benefits from the excellence of the audio system and the incredible Multibeam LED headlamps. At Rs. 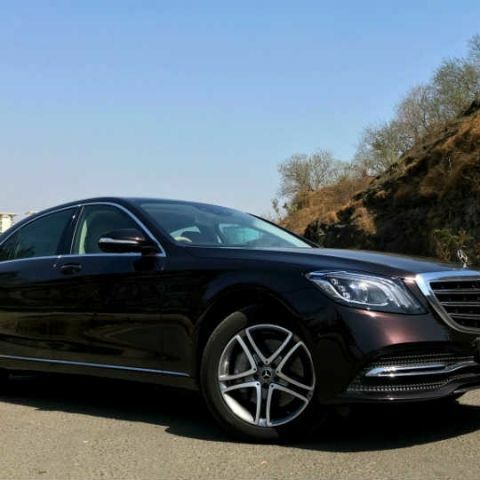 1.32 crore (ex-showroom), the Mercedes-Benz S350d is special. It rides like the royalty, and it well and truly is. Leave it behind, and you just won’t feel like driving another car apart from this, for at least a couple of days.